Being the restaurant owner, have you ever felt cash missing in the drawers? Not once, but we often experience this insecurity on a regular basis. Agree? This is exactly the point where emerges a need for upgrading our manual system of managing restaurant tasks and switching to a fully automated and error-free system. Majority of the restaurants have made a wise decision of getting POS system implemented in their restaurant to make their daily tasks accurate, reliable, easy, and error-free. Implementing a POS system for your restaurant will not only make the daily tasks easy but will assist you in analyzing accurate sales report either on a weekly or a monthly basis. Instead of manually managing your sales, you will now be able to get a brief list of sales made by the restaurant in the whole month in a clear and easy to understand format. Here are the few basic advantages of POS generated sales report! Saves your time: Managing the daily or weekly sales either on registers or on excel sheets is just not possible to do quickly and on a regular basis. The manual method demands a huge time for the staff to maintain the sales made completely. 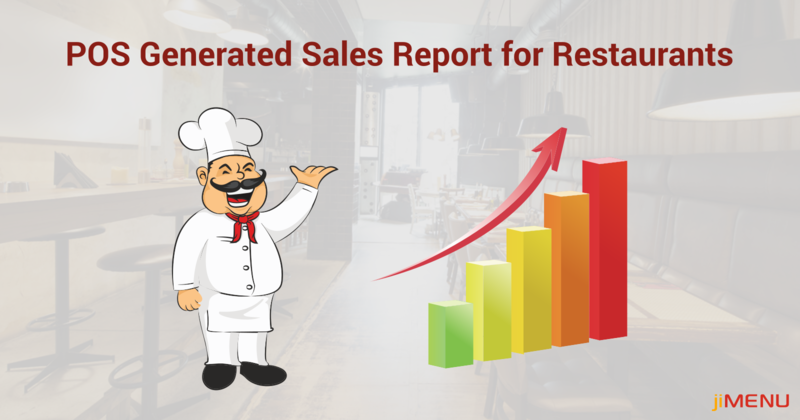 Complete reports: If yours is a big restaurant with a wide variety of food items, it simply becomes impossible to create reports of the sales category-wise. Therefore, it becomes difficult to analyze that in which category you are getting good sales, while in which food category you need to increase the quality. The POS generated sales report will present you with complete and category-wise sales report in a clear graphical form. Automation prevents mistakes: No matter how precisely we are managing the records in registers, there are endless chances of making errors and missing details. While managing reports on excel sheets, there are chances that you mistype a number, or alter any field while closing the sheet. But when the reports are managed over an automated platform, it directly eliminates the chances of errors and offers you accurate outputs. Prevent problems actively: If you are falling short of stock in a particular food item, or if the food quality is falling in one particular food item, if there is a good demand of a new dish, is just not easy to predict manually. Isn’t it? Going for a POS generated sales report will present you a clear idea about in which all items are you lacking and need attention on. Choosing a POS system is the perfect answer to the daily problems you encounter in your restaurant. Beginning right from the table management for the guests till their payment, all is handled smoothly via the POS system. Not only this, analyzing sales and maintaining a proper coordination amongst your staff members is held perfectly with the POS system. Its simply a one-time investment of yours. Investing in a POS system will daily realize you that you actually took a wiser decision while choosing POS system for your restaurant. How can jiMenu POS help you? jiMenu POS provides you with a unique solution for your restaurant and hotels. With jiMenu POS, you can manage maximum guests and provide them a huge set of services including self-ordering, checking vacant tables and choosing accordingly on the customer end, making orders, making the payments via multiples methods, and analyzing sales of your restaurant in a graphical form! The best part about jiMenu POS is that it comes with solutions which are budget-friendly along with 24/7 assistance. For more details or queries, get in touch with us!